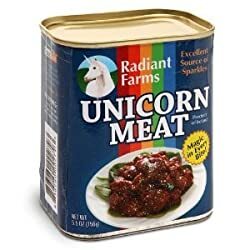 Canned Unicorn Meat Of course this isn't as good as fresh, but who has time to hunt unicorns these days? I'm a busy professional so I don't have the luxury of just grabbing my bow and quiver and spending days in the high glens hunting fresh 'corn. This product allows me to come home from a hectic day and enjoy a meal packed with that special nutrition only unicorn can provide. I even keep a few cans at the office for those late nights.